A genus of parasitic protozoan flagellates, formerly part of the genus Trichomonas but now separated as a distinct genus by the absence of a pelta and the presence of three anterior flagella. Species include Tritrichomonas foetus, which causes bovine trichomoniasis, and Tritrichomonas suis, which occurs in the nasal passages, stomach, cecum, and colon of pigs. 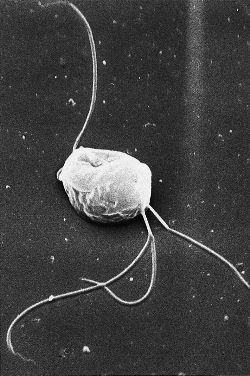 a genus of protozoan parasites with three anterior flagella in the family Trichomonadidae. found in the cecum and colon of guinea pigs but is not pathogenic. found in the ceca of the chicken, turkey and duck. found in the cecum and colon of Bos indicus and Bos taurus, but has no pathogenic effects. thought at one time to be the cause of acute and chronic undifferentiated diarrhea in horses but usually considered to be non-pathogenic. found in cattle, pig, horse and deer; causes trichomoniasis in cattle and large bowel diarrhea in dogs and cats. found in the cecum and colon of rat, mouse and hamster. found in the cecum and colon of mouse, rat, hamster and wild rodent. found in the stomach, small intestine, cecum and nasal passages of pigs. difficile, and (in the case of cats) Tritrichomonas foetus. Direct sequencing and phylogenetic analyses confirmed that the isolate of the flagellated trichomonad identified from this investigation is more phylogenetically related to H meleagridis than Tetratrichomonas gallinarum, Tritrichomonas foetus, and Dientamoeba fragilis. Campylobacter fetus or Tritrichomonas foetus) was previously described in bovines in RJ and other Brazilian States (ROCHA et al. Comparison of the diagnostic sensitivity of a commercially available culture kit and a diagnostic culture test using Diamond's media for diagnosing Tritrichomonas foetus in bulls. Tritrichomonas foetus, agent of bovine trichomonosis, was recently recognized as a primary cause of feline trichomoniasis, a large bowel disease characterized by intermittent or chronic diarrhea mainly occurring in multihoused cats from catteries or shelters [1-3]. Lectin binding patterns and inmunohistochemical antigen detection in the genitalia Tritrichomonas foetus-infected heifers. 1967) Hydrogenosome, a cytoplasmic organelle of the anaerobic flagellate Tritrichomonas foetus, and its role in pyruvate metabolism. Ademas, el fluido abomasal se sembro en medio de cultivo para Tritrichomonas foetus. Some trichomonads, including Tritrichomonas foetus and Tritrichomonas suis, primarily infect and colonize animals. Omeprazole inhibits the growth of Leishmania donovani (6) and is also effective against the bovine pathogen Tritrichomonas foetus. Pyometra is also an occasional clinical sign of trichomoniasis and Tritrichomonas fetus should be suspected as a cause in cases of pyometra that develop during the breeding season. Extensive work has been done by Connaris and Greenwell (15), who demonstrated that both Trichomonas vaginalis (TV) and Tritrichomonas foetus possess a wide range of intracellular glycosidases.